Today, April 14, is Black Day in Korea. What is Black Day? It's one part mourning, and one part celebration. It's the day that Korean singles gather together, dressed in black, and eat black noodles, lamenting their singledom and joining others who feel the same way - misery loves company, right? Black Day is a little emo, a little dramatic, a little funny, and altogether Korean. Why are they so down? In the West, most singles only feel the pangs of love nearing Valentine's Day. If you think that's tough, try being Korean. In Korea, there's not just one day, but thirteen special days designed to celebrate love! Now before you pity those who aren't coupled, fret not. Only two of these days are equal to Valentine's Day in popularity, and those are White Day and Black Day, celebrated March 14th and April 14th, respectively. All of the love days fall on the 14th of each month, with the exception of Peppero Day, which falls on the 11th of November and is a cultural phenomenon all its own. Intrigued about Korean couple days? Grab your partner and don your matching couples' attire, read on, and learn how to celebrate (or avoid!) 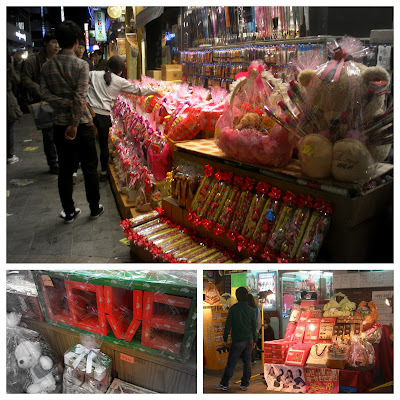 Korea's special days of love. Couples exchange diaries or agendas, and write their anniversaries or wishes for their next year together. If that year will include all of the pricey couple day outings, perhaps they should also schedule a bank appointment. Women present the men in their lives with chocolate treats. Women can confess their love or indicate their feelings by giving their chosen beau chocolates, and the more elaborate the treat, the greater the romantic attachment. Men return the women's affections with candy gifts, or any gift of their choosing. Again, the fancier the gift, the more he fancies you! This one's for the singles. Solo guys and gals mourn (or celebrate!) 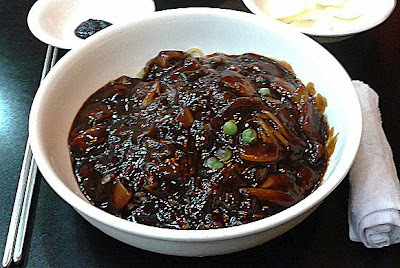 their lack of romantic partner by dressing in black and gathering together to eat jjajangmeyon, or Korean noodles with black bean sauce. Foods blackened with squid ink are also becoming popular, as is black coffee, and I wouldn't be surprised if the coffee shops or squid-sellers soon latch onto this day as an excuse to boost sales. Couples give roses to one another, while hopeful singles gather once again, this time in yellow dress to eat yellow curried rice. Although yellow is a sunny and optimistic colour, I personally think that curry-breath won't help help anyone get a date. This is the time to shower your beloved with kisses. Finally, a holiday exclusively for making out. Pucker up! Couples clothed in green attire have fun frolicking outdoors, leaving their single companions to drown their sorrows with soju, a cheap and popular Korean alcohol packaged in - what else?- a green bottle. On this day, couples take a photo together to display in a special place, and this provides a great excuse to visit the ever-popular instant photo-sticker booths. Couples may also wish to visit a nightclub or a noraebang (singing room) so that they can serenade one another with the love songs of their choosing. I imagine that broken-heart ballads may also be popular with the singles set on this day. A good excuse to get tipsy on some tipple with your better half. If you're still single and bummed about it, I advise that you forget your troubles and just down a bottle solo. The perfect time to have a movie night with your beloved. With the abundance of smart devices in Korea, this could be done anywhere, but the romantic atmosphere of a cinema or DVD bang (DVD room) is preferred, especially since you can make out in a DVD bang. Hug it out with the one you love, or, if you really need an excuse to spend some more money on your honey, go and buy them a pair of socks to keep both their feet and their hearts warm. Free Hugs in Seoul's shopping hotspot, Myeong-dong. And finally, the biggest and the baddest of the holidays and equal to Valentine's Day in terms of revenue earned is the true commercial holiday, Pepero Day. Pepero is a chocolate covered cookie stick manufactured by the Korean conglomerate Lotte. This special day is celebrated on the 11th day of the 11th month as the long slender shape of the Pepero cookie resembles the digit 1, and four Pepero cookies will resemble the date 11/11 (or five cookies, if you're counting the slash!). Koreans of all ages exchange boxes of Pepero cookies, and shops sell numerous and impressive gift packs, toys, cards, and accessories. It's also popular to make one's own Pepero-style cookies, or to assemble elaborate gift packs yourself. Some celebrants opt instead to participate in 11/11 in a less commercial fashion with Garraetteok Day, exchanging the traditional white glutinous rice cake that's served in long, thin strips. Now you know why Korean singles are feeling a bit blue on Black Day. If you're feeling lonely and lovelorn, take a hint from the Koreans. Don some new duds, get together with friends new and old, and eat some good food! Happy Black Day, everyone!